We’ve had a terrific number of blueberries on our 4 bushes this year, best ever. So I have made blueberry muffins, and we’ve eaten them raw with raspberries and meringue and cream – yummy. 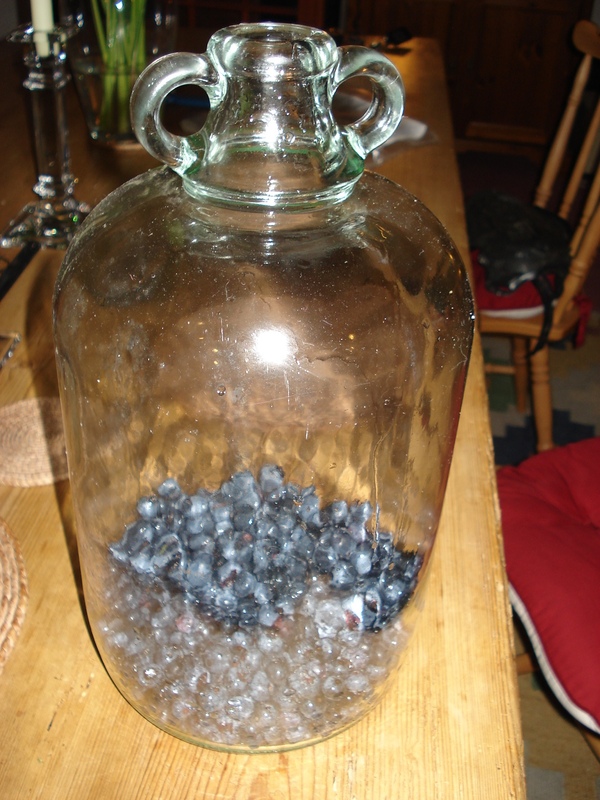 But then I started looking around for a blueberry liquer recipe and found one for Blueberry Vodka. 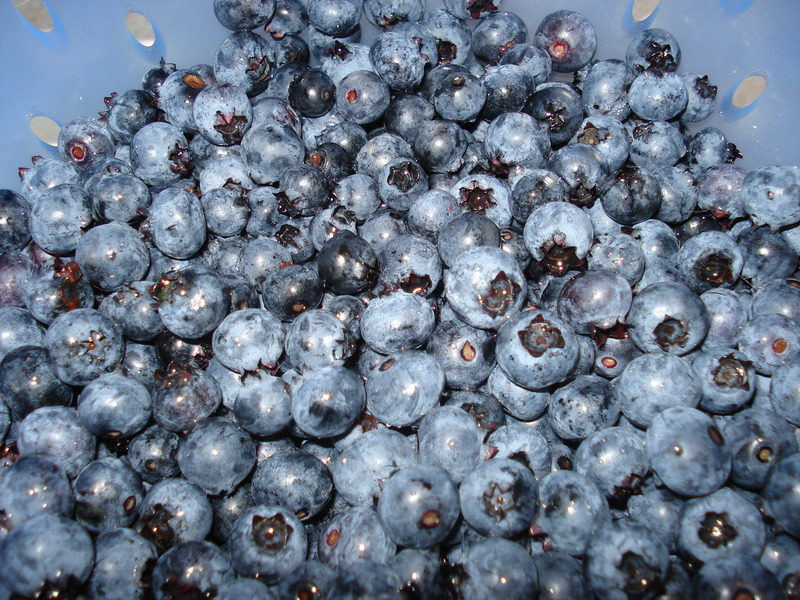 First you pick the blueberries and wash and dry them. You need between 450 to 500g for this recipe. Then you tip them into a demi john or large jar. Next you add 210 grams of white sugar. I used granulated sugar. Then add 500ml of vodka. 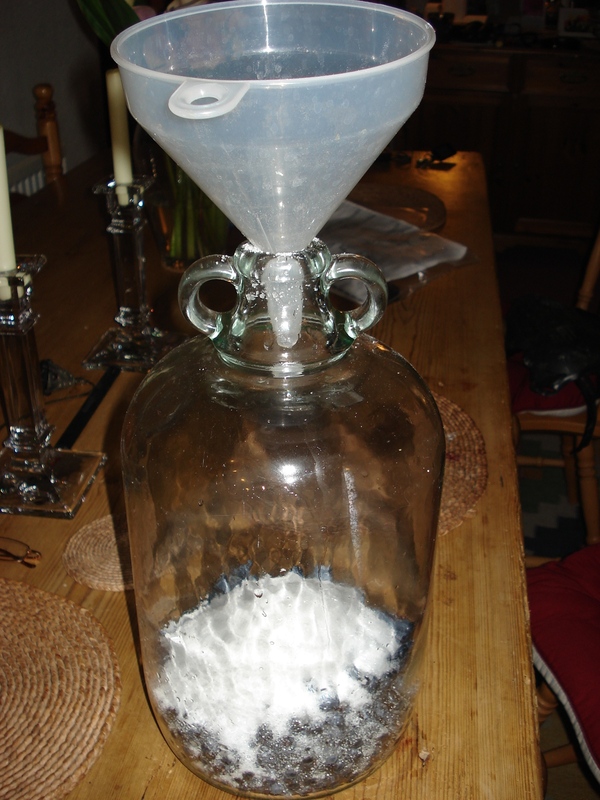 For a larger bottle of vodka, increase the quantities of sugar and blueberries in proportion. Then give it a good shake and cover and keep in a cool place for at least 2 months, shaking daily. After at least 2 months, strain off the berries and pour into a suitable bottle. 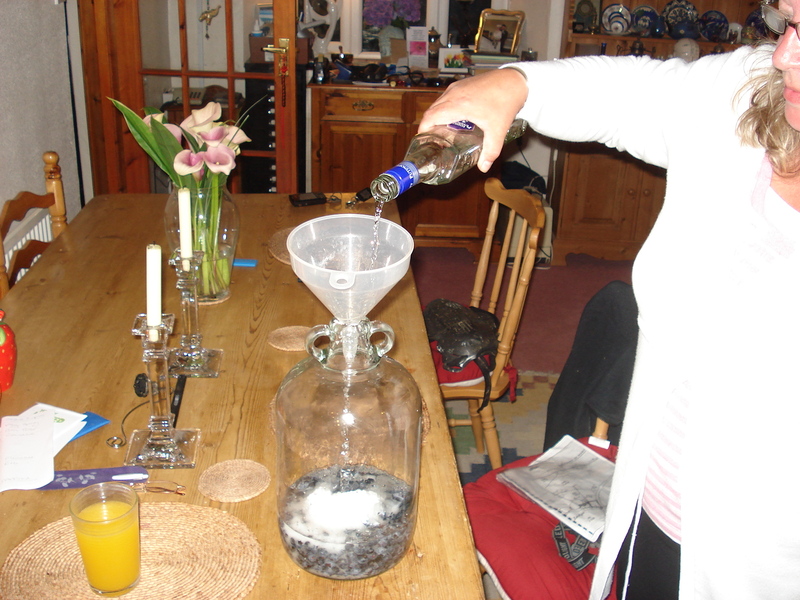 The blueberry vodka, or blueberry liquer should be ready for drinking. 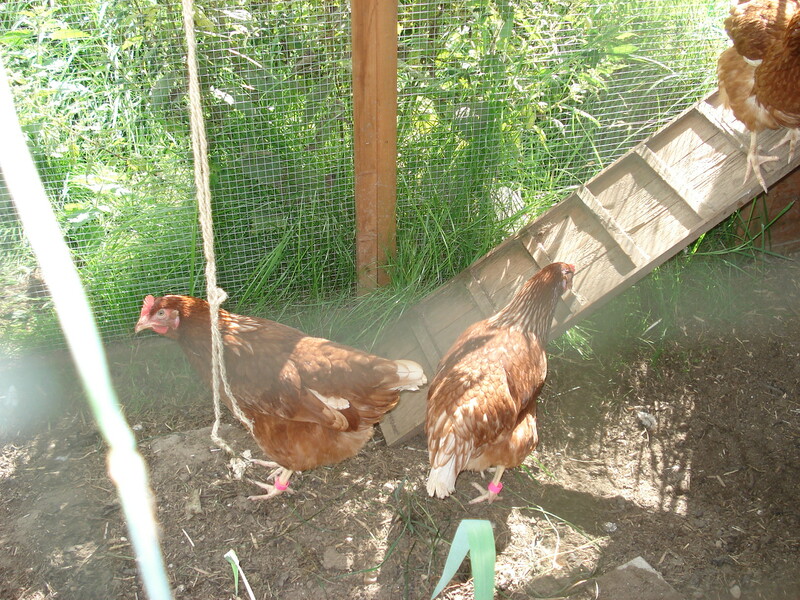 Our old brown warrens and brown lohman hens have not been laying much now for quite a while and we were wondering what to do about it. We got the 4 new point of lay brown warrens 2 weeks ago and that had taken us up to capacity in the hen house, so we didn’t have room for any more new ones whilst we still had the old ones. Then Neil had an idea. We could offer the old ones up as pets on “Freecycle”. 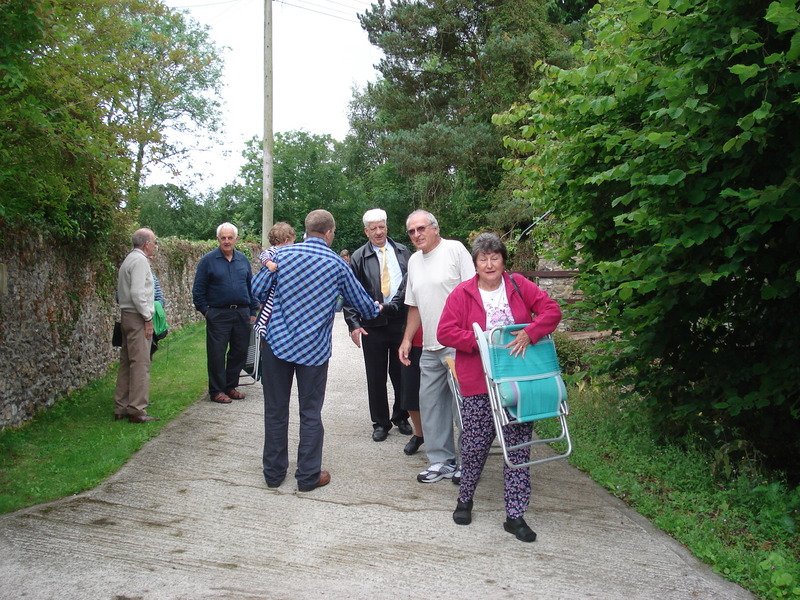 Freecycle for those who don’t know is a bit like ebay but where no money is exchanged. You offer something that you want to get rid of and someone replies they’d like it and then they come and pick it up. Anyway we got several replies and we studied them to ensure that where our old hens went was going to be suitable accomodation with lots of space to run around in, and we chose a place in Barrington, which is quite near here. The couple came over on Wednesday and picked them up. They were a really nice couple, stayed for an hour, had a cup of tea with us, and we were assured they were going to a good home, but I did feel a bit guilty about letting them go, just because they weren’t laying much. 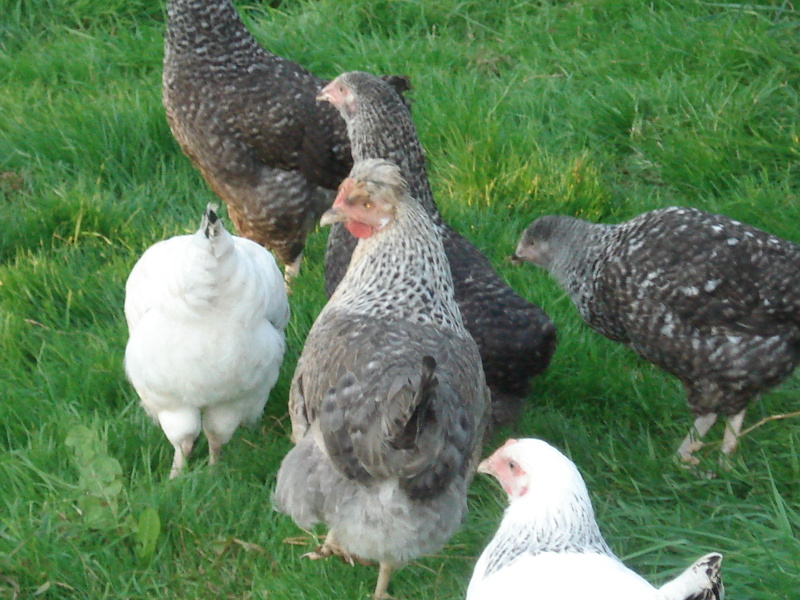 We trawled the internet and found a poultry farmer near Wellington who had for sale point of lay pullets that were different breeds. And on Friday afternoon we made our way through the rain and the country roads to Fenton Farm, in Pouton Regis,which was the middle of nowhere. We were shown to 2 barns full of hens and then the farm hand had to catch them for us. He used a landing net because they are quick and they don’t like being captured!! We had taken a large cardboard box with us to put them in, but as soon as we got one in and then went to put the next one in, the first one would jump out again, so it was quite amusing trying to catch 8 new ones. 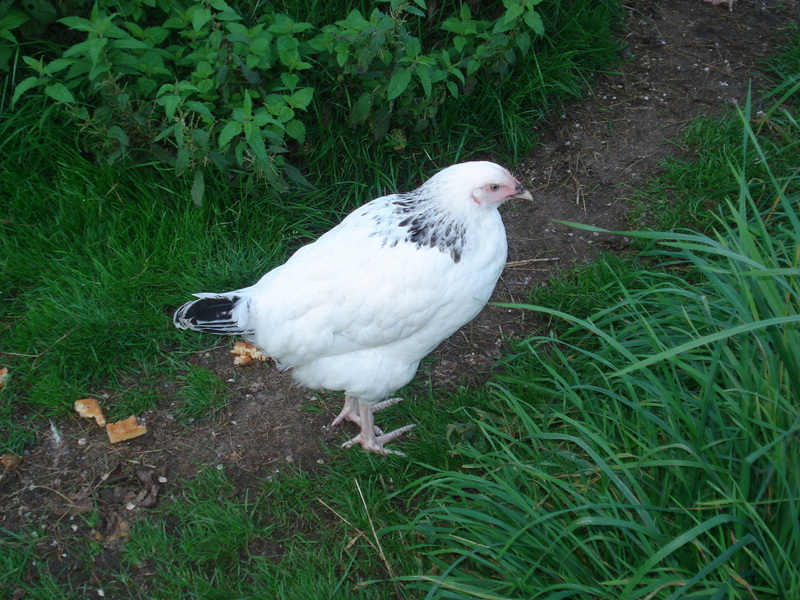 We have purchased 2 cream legbar hens, that have lovely markings, gold on top with grey underneath. They will lay blue eggs. 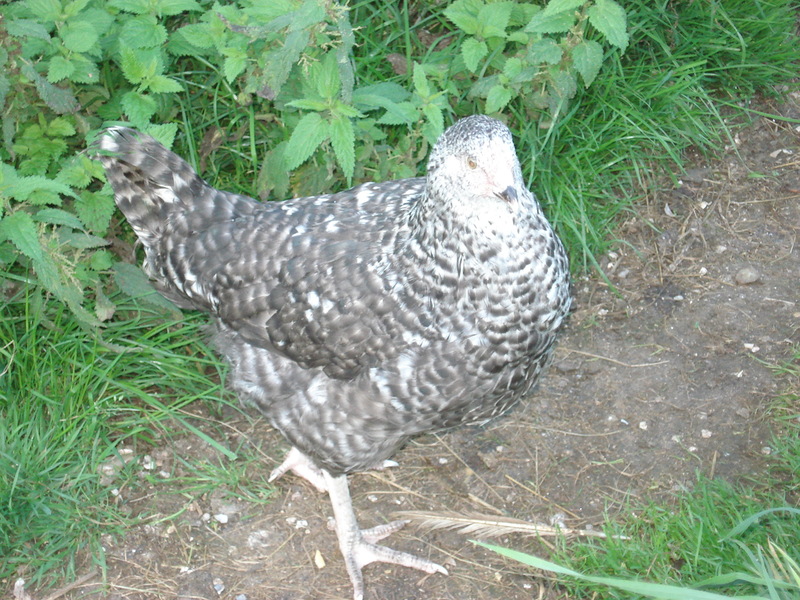 Also 3 Speckledys, which are grey speckled and will lay speckled eggs. 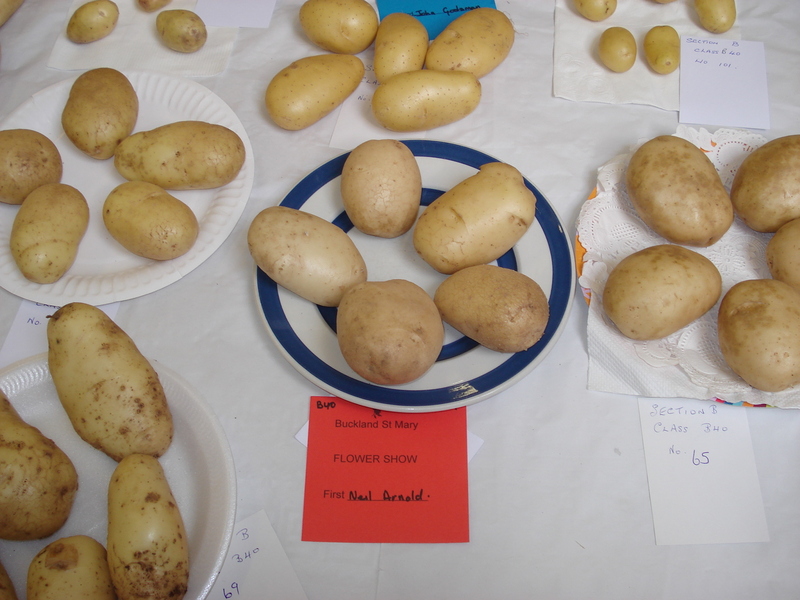 And 3 Light Sussex which will lay brown eggs. At first our 4 Brown Warrens were pecking the new girls and intimidating them, so much so that the new girls wouldn’t come out of the hen house. 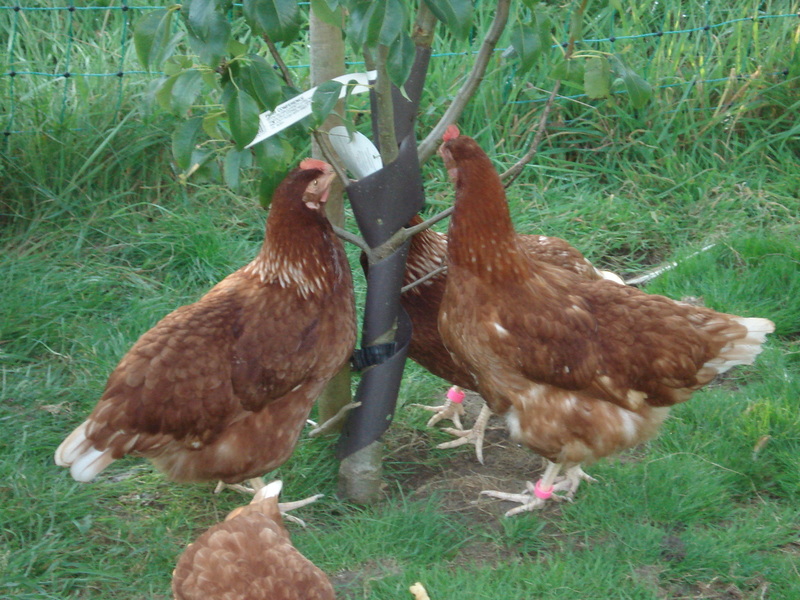 However they are just bird brains, here they are pecking at the label on the young pear tree. 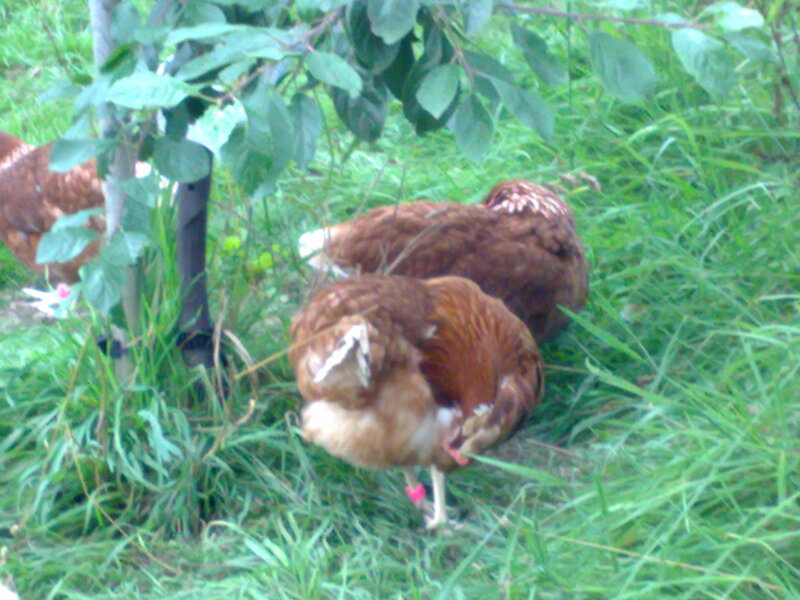 Today, which is only 2 days since their arrival the new hens ventured out into the paddock and had a peck around, so that was pleasing to see. I’m sure it won’t take long for them to settle in and find the pecking order. Now all we need is for them to start laying eggs. The actual age of the birds when they start laying can be between 22 and 24 weeks, so we may have to wait a few weeks before we get regular eggs. 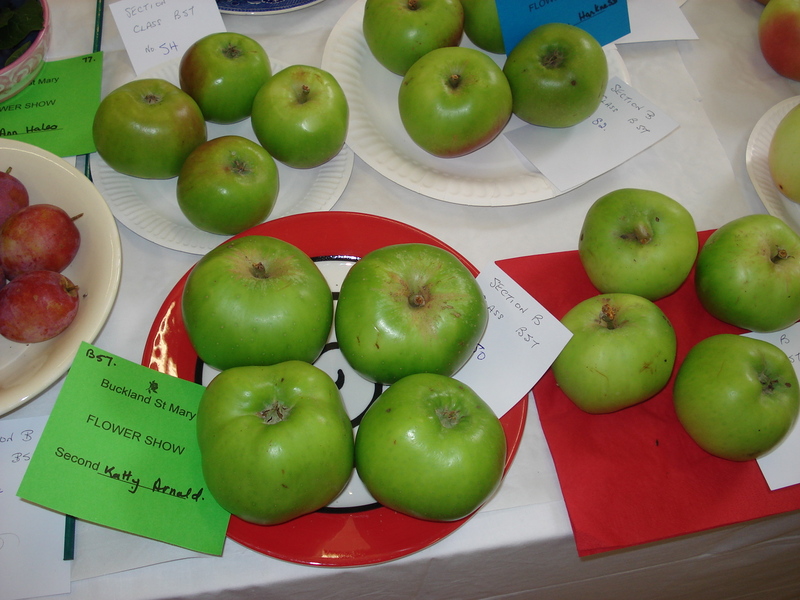 I might even have to go and buy some, which I’ve not done for over a year. Anyway they had better start laying soon, as I’ve promised our B&B guests fresh eggs from our own hens!! 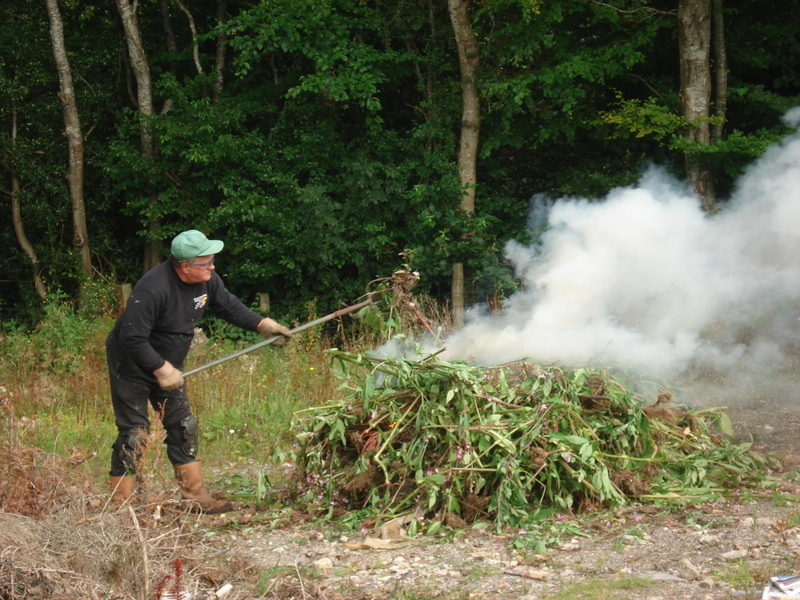 Last week we had a huge pile of woodchips delivered and dumped round the back by the paddock by a local woodman. 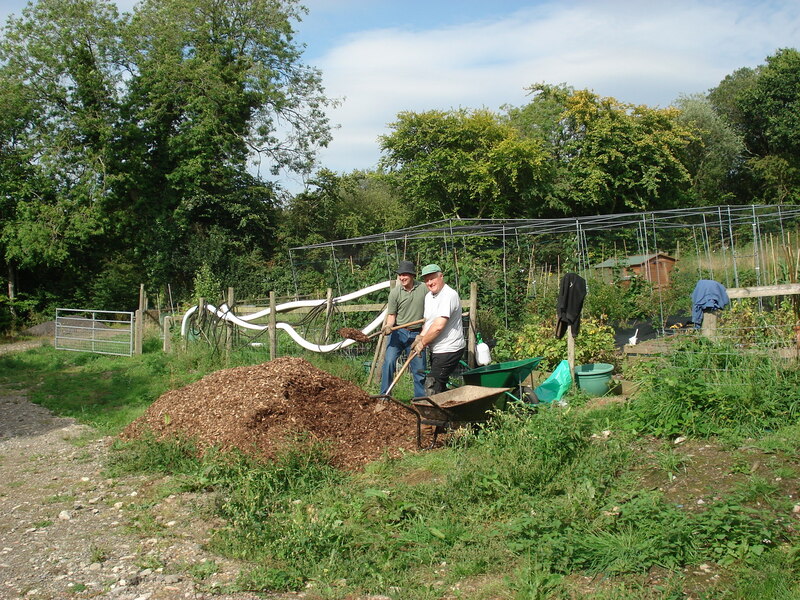 Our friends from back in Langley, Martin and Wendy came to stay last week for a couple of days, and very kindly offered to help spread the woodchip over the black suppressant sheets that we had put down as paths between all the vegetable beds. 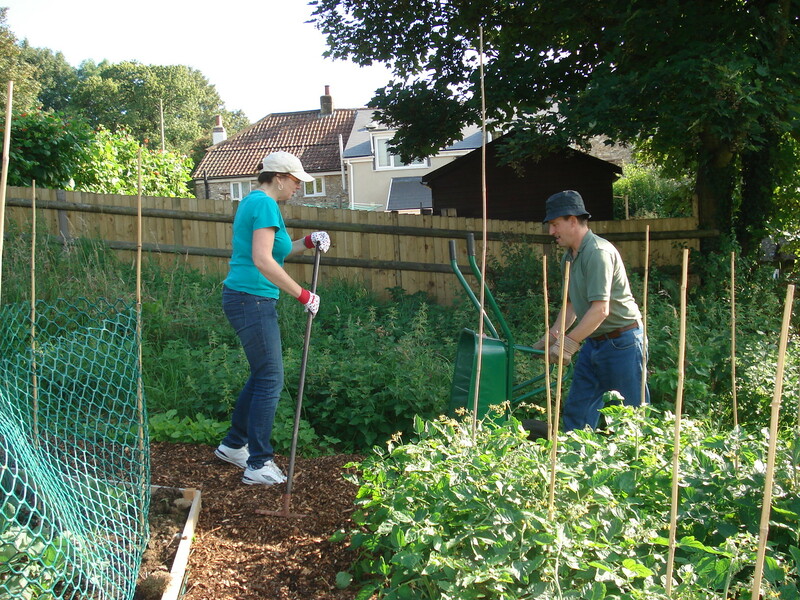 So Martin and Neil shovelled the woodchip into wheelbarrows and trundled it up the black sheets to where Wendy and I were standing with rakes to flatten it all out. We used the whole pile of woodchips to cover all the paths. 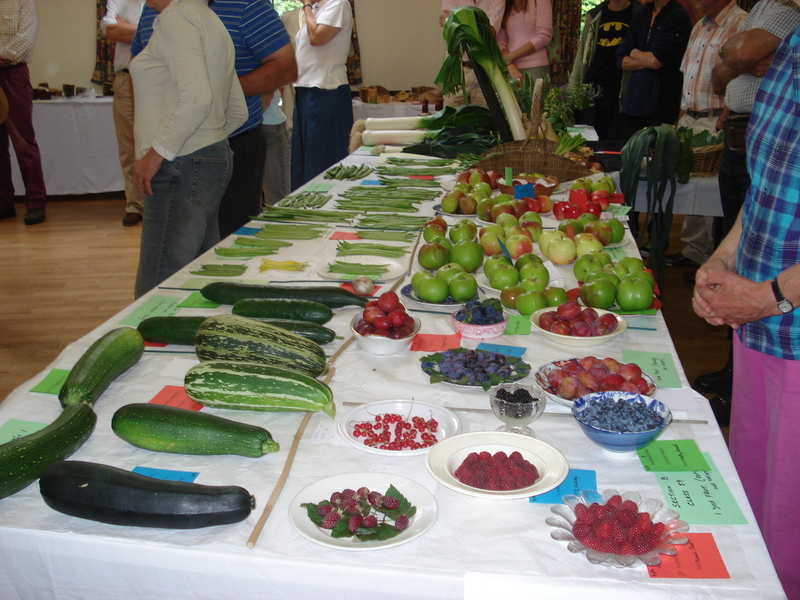 We didn’t have enough to do round the plants inside the fruit cage, so will have to have some more delivered. 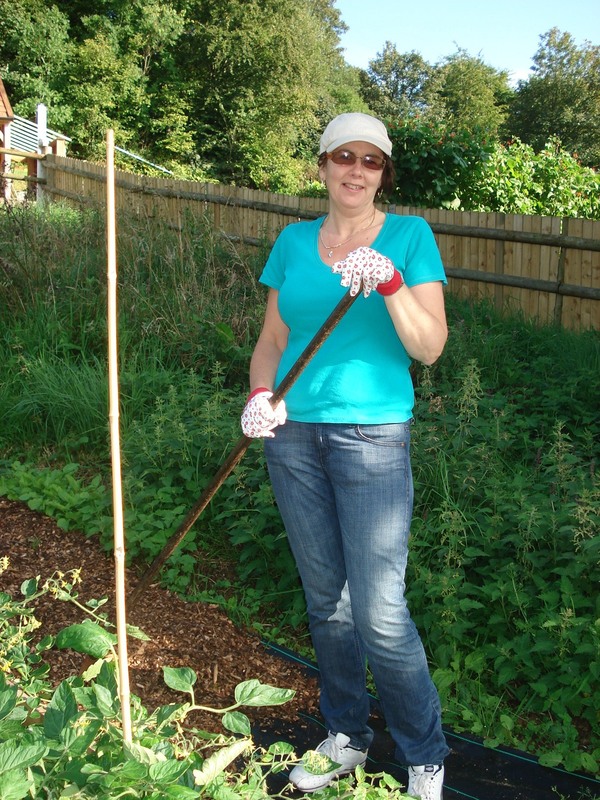 Anyway, now we have really nice paths to walk on around the raised vegetable beds. Bullies in the hen run! As our existing hens are getting on in hen years, 6 being 2 years old and 6 being 2 and a half years old, and not laying so many eggs these days, we decided it was time to get some new hens called “point of lay pullets”. This means the new hens are only 18 weeks old and at the time in their life when they start to lay eggs. So 4 new Brown Warrens duly arrived on Friday evening. We put pink leg rings on them so we could tell them apart from the others, but in fact they are much darker brown so quite easy to differentiate anyway. The new gels - the pink legs! But our existing hens were none too happy about the new arrivals. As soon as the new gels ventured out into the hen run, the older ones would jump at them and peck them, until they ran back into the hen house. This is the third day now we have had the new gels, and still they are cowering in the hen house run. The new gels taking cover in the hen house run. We’ve been told that if you put them all in together at night, then they get used to each other and the bullying should stop. But at night the new gels don’t want to go into the hen house, and each night, Neil has had to don his leather gloves and pick them up one by one and pop them in the hen house with the others. Hopefully over time, once the pecking order is well and truly established, the bullying should stop and the new gels will be free to roam the hen run without fear. 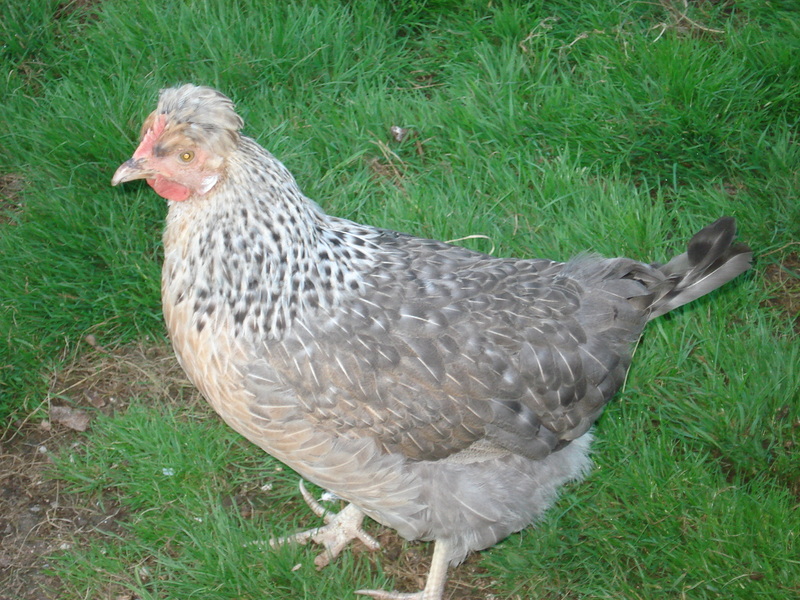 We should start to get some lovely brown eggs now for our B&B guests from the new hens. Today was the BBQ at Bethany in Bishopswood. Bethany is the home of the new pastor Stuart and his wife Amy. 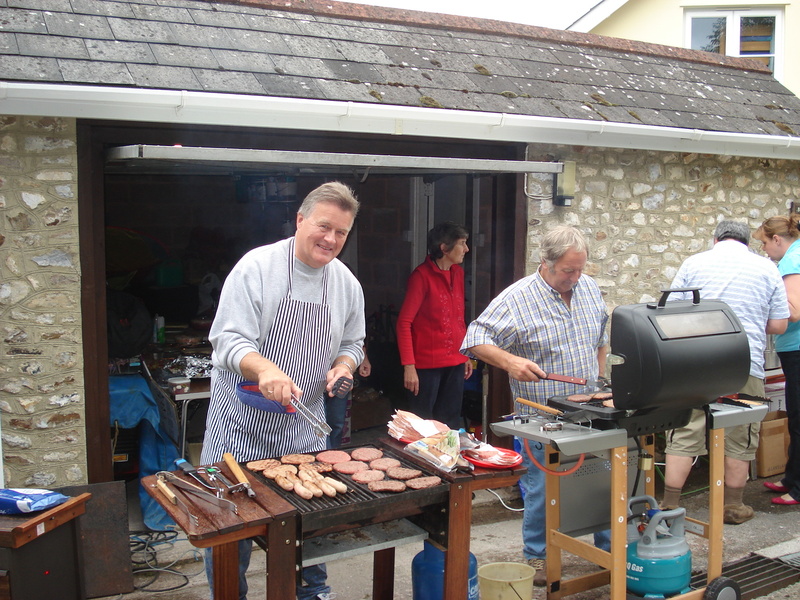 The BBQ was to welcome them to the parish as they have just moved in, taking over from Brian and Kath who have retired to France. It was a “Bring your own chair” do, so people arrived encumbered by various chairs. Neil was co-opted in being a chef for the day, and gladly donned a striped apron, tongs in hand. 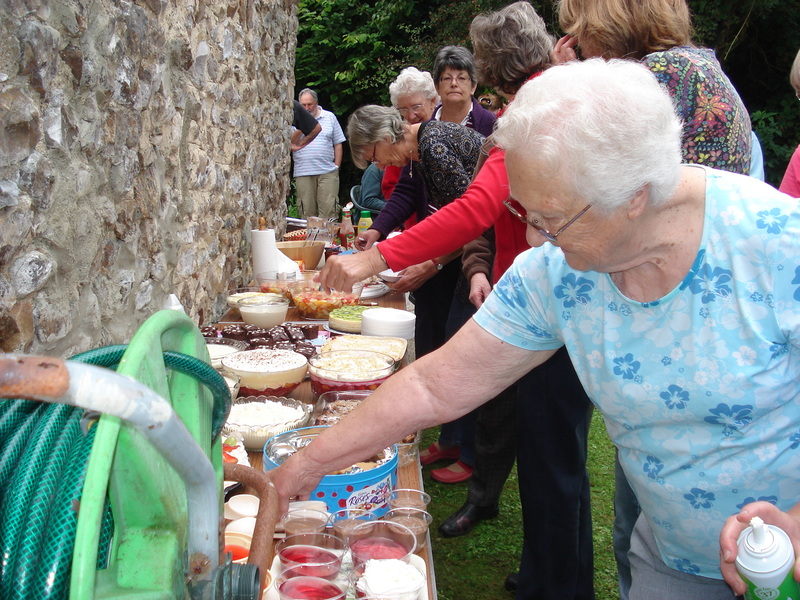 I made a lovely strawberry flan to add to the numerous and varied desserts which us ladies of the village had produced. 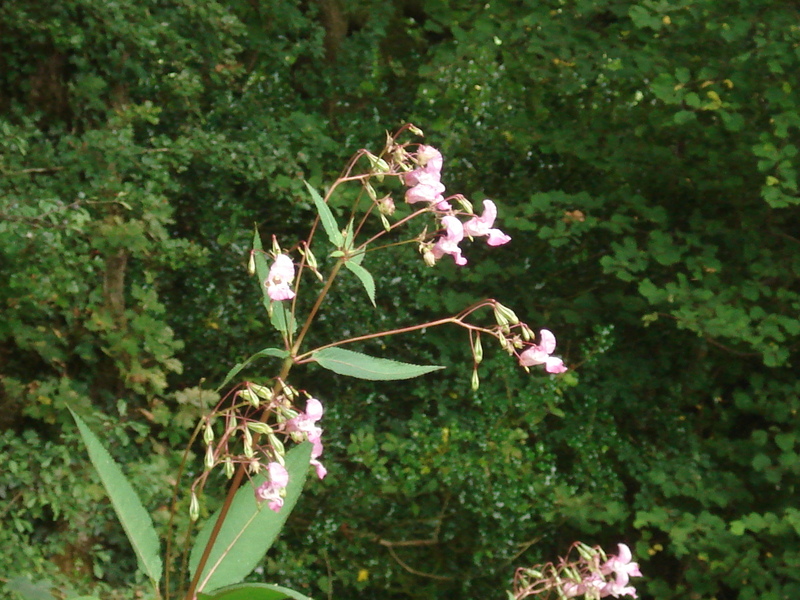 We had some rain earlier on this morning but by afternoon it had dried up. The weather held up for the duration and many people turned out. So all in all a good afternoon was had by everyone who attended.